No, dear reader, this is not about the grounding of the Boeing 737 Max 8 and 9. That’s a different kettle of soup. 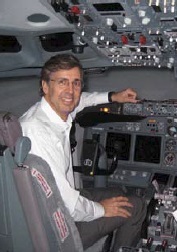 This is actually the second installment of the story begun in the January 2019 EAA 1541 newsletter entitled “Airline Pilot for a Day”, where I described my initiation into the world of full motion airliner simulators. That introductory experience, hosted by a group called ATOP — Airline Training Orientation Program — was such a fun adventure that when I later got an email from them advertising an advanced IFR training session in the Boeing 737, I jumped at the chance. As an added stimulus they offered to sign off an Instrument Proficiency Check (IPC) for any aviator who could successfully complete the Air Transport Pilot IPC to ‘practical test standards’ (PTS) i.e., the same ones every instrument-rated pilot had to meet to get their instrument ticket in the first place. Lost in the dim fog of distant memory was that the PTS standards included maintaining assigned altitudes within 100 feet, airspeeds within 10 knots, assigned headings within 10 degrees, and following approach course guidance no more than ‘two dots’ above or laterally, and no descent below glideslope or non-precision step down altitudes at any time. Fair game, I thought. I’ll take a shot at that! A group of four intrepid aviators gathered at what was then then United/Continental Airlines training facility at Bush Intercontinental airport in Houston on a dreary Saturday in January. It seemed somehow appropriate that we’d have real IFR conditions outside when we stepped into the completely synthetic IFR world of the full motion flight simulator. We met with Wayne Phillips, who is the founder and chief instructor of the ATOP program, and an FAA FSDO guy in the Great Lakes region. Wayne shepherded our group to a briefing room in the training facility, and led a three hour ‘chalk talk’ of the IFR procedures we would be expected to fly. These included a low visibility takeoff, and a long program of maneuvers all conducted in IMC conditions: steep turns, recovery from unusual attitudes, a landing configuration stall, a teardrop entry into a holding pattern, exit from the hold to a precision approach to minimums with an ATC commanded go-around, an outbound procedure turn to a non-precision localizer-only approach to a landing, followed by a non-precision approach with a circle to land on an intersecting runway. All of that added up to an hour in the left seat as Pilot Flying, followed by another hour in the right seat as Pilot Monitoring. None of that old “Captain and First Officer” rubric any more: this is the world of Crew Resource Management where everything that changes the current status of the flight is verbalized and agreed to by both flight deck personnel, before anybody touches a button or moves a yoke. When we asked Wayne how many pilots had gotten their IPCs signed off during the program, he responded, “Out of nine so far, none.” Gulp. At first we wondered whether we and our predecessors were all inferior creatures from the middle earth of General Aviation. Later we found out that it was more or less bound to turn out that we would not succeed, because in the real world of recurrent flight training, airline pilots rotating through the facility get an initial day to ‘knock the rust off’ and during which there is total amnesty for making mistakes. We had no such luxury. The first time we would have the throttles and yoke of the mighty Boeing in our hands would be the start of the IPC test. By luck of the draw, I got the opportunity to sit in the right seat for the first session, while my Pilot Flying crew buddy, who was a multi-engine rated IFR pilot with lots of hours in his Beech TravelAir (a Baron precursor), tried his hand at running the gauntlet. Things didn’t go well for him shortly after entering IMC conditions on departure, and he found himself chasing the flight director to maintain both course and climb rate. Note to self: concentrate 100% on the six square inches of the artificial horizon and just fly the plane; give verbal commands to the Pilot Monitoring for everything else, including headings, courses, target altitudes and rate of climb or descent displayed by the flight director needles. As a multiengine pilot, my left-seater also got to experience an engine failure during one of the approaches. Even in the Boeings, it’s dead foot = dead engine but there is so much power available that single engine operations are pretty much just a readjustment of the rudder trim. And since nobody touches the rudder pedals in a B737 anyway, one pretty much starts with two dead feet during the engine out phase. My Pilot Flying on that leg was pretty disgusted with himself about blowing the IPC within the first minute of the exercise, and was still muttering to himself hours later, though he did a pretty credible job on all of the other procedures. After an hour and more than a little sweating in the dark, rumbling and pitching environment of the simulator, we all emerged for a brief coffee break, and the second crew took the front seats for a replay of the same maneuvers. Pilot Flying #2 was an instrument flight instructor from Hawaii who had just completed the ATOP introductory session the day before. No fair, methinks: too much recent experience compared to the rest of us. After another break outside the simulator, we all climbed aboard for flight #3 with me in the left seat and my multi-engine buddy as Pilot Monitoring. 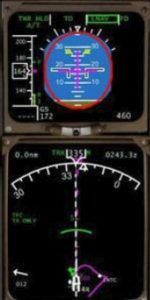 My single pointed conviction to keep “the pink in the wings” ie., to keep the virtual airplane on the artificial horizon centered on the pink lines representing the flight director bars, was rewarded with a smooth takeoff, climb and level off at the assigned altitude. With judicious use of the trim button, all went well with stall recovery (gotta love stalling a 350,000 pound airliner!) and unusual attitudes. But my comeuppance was the simplest maneuver of the lot: the 45 degree banked turns to the right and left in IMC conditions. My brain got scrambled by the fact that jet artificial horizons turn the opposite direction of their GA cousins, and the absence of any lateral G forces during banks in the full motion simulator. The seat of one’s pants does not tell you in the sim whether you are at 30, 45, 60 or more degrees, and I was in the mindset of expecting to feel something that never occurred. I inadvertently rolled to 60 degrees (ahem, a normal turn profile in an RV!) and Mr. FSDO busted me promptly. No matter that every other part of the flight, including the hand flown non-precision approaches and holding pattern, met the PTS standards. Miss one and you miss them all. But like the other pilots, I got a cool 2 hours of B737 time added to the logbook, and a description in the log of all of the maneuvers performed in IMC conditions. My overall impression of controlling the Big Fella was that flying the 737 with precision is a high cognitive workload affair. Even my RV-10, which has less pitch stability than famous IFR flyers like Skylanes and Bonanzas, is more stable when trimmed than the 737-800. The nose of the Boeing constantly wants to wander just a little up and down and side to side. The pilot can’t feel it, but the flight director senses it and is forever moving the pink bars slightly out of the centered position. It takes only two fingers to make the corrections, but like an RV in IMC conditions, take your attention away from the display to change a frequency or set a heading, and you’ll be chasing the needles to get things back in close tolerances. No wonder airline pilots go on autothrottles and autopilot immediately after liftoff and don’t take the yoke back from George until the last couple of hundred feet of the descent. And the 737-800 has an auto-land with auto-braking mode that makes the pilots spectators until it is time to exit the runway onto the taxiway. After my first experience in the Boeing simulator, I gleefully wrote that I had met the beast on its own terms and come away a happy and proud GA pilot. I left the IMC world of airline flying humbled by the difficulty of hand flying every moment with exquisite precision, with great respect for the folks who do this kind of thing for a living, and with a deep understanding of why there are always at least two sets of brains, eyes, and hands in the front office of their marvelously complex machines. Like the first experience, this one also made my ‘top five ever’ aviation experiences. Think you’d like to try it? There may still be a chance to be the first-ever ATOP pilot to get an Instrument Proficiency Check signoff! Check it out at www.b737.com.